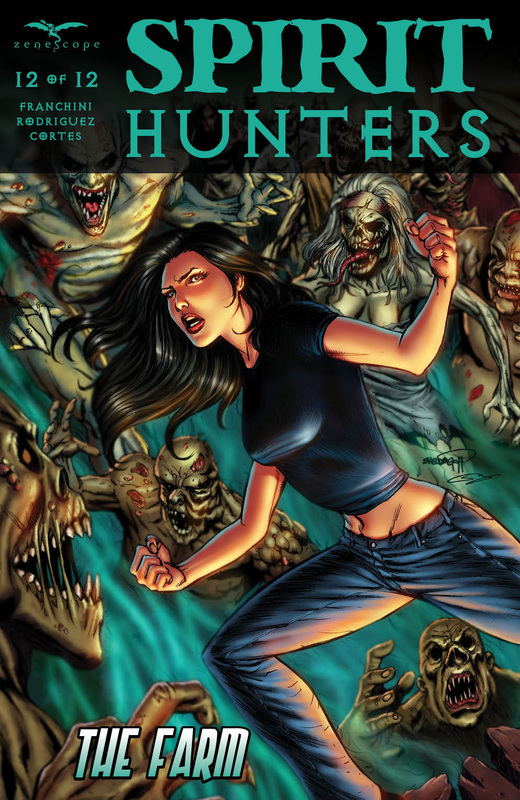 SERIES FINALE In the final issue of Zenescope’s breakout horror procedural Spirit Hunters, each member of the team faces their own worst nightmares. Will Ellen suffer the same fate as her mentor Michael Chase’s dead wife, or will she rise to save her friends from the wicked spirits breaking through to our world? The final issue of Spirit Hunters. It feels like it’s been a while, but luckily this issue is pretty self-contained. It works well because it links some of the threads of the maxi-series, but also gives you a good story in one. the conclusion is very interesting…. Ellen is, of course the key to all of this, and she does take the lead. They end up in the UK on a a haunted farm. The build up is very interesting – as is the reaction of the residents. Too late, she realises it is a trap and the team are trapped in their own versions of hell. Ellen has to make a decision, and it looks to be a hard one to rescue her friends. She makes a different decision in the final battle and that is well told! I liek the build up in this, the reactions from the team, before, after and during their own personal hells. The art is well done, with some nice touches – especially in hell. The ending is interesting as well, as their may be more from this team – I hope so!